Last month I posted about a pretty cool city map generator that gave you a lot of options for building any sized city on the fly. The only real problem I saw with that program was that while a map is useful, it is only part of what a GM needs to build a city. 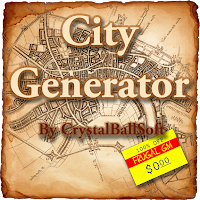 This City Generator, from CrystalBallSoft, is a simple & easy to use generator that has a number of options that really lets you tweak the city to your needs. The greatest part of this generator, the thing that puts it above just about every other generator I've ever seen, is that you can tweak the number & type of city wards. Combine this with building & profession generation and you've got a decently fleshed out city that doesn't take up a lot of space. I envision using this with the aforementioned city map generator and a couple simple name generators. I don't think I'd need a whole lot more work to put together a city on the fly. 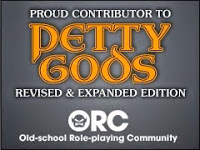 It might be nice to have all my NPCs statted, but all I really need is a good framework that gives me enough to work on the fly and keep good notes. The sourcebook in question, an item on my DriveThruRPG wishlist, is A Magical Medieval Society: Western Europe. When I get this book I'll definitely be reviewing it.